In light of Aaron’s recent post on the Walmart Savings Catcher, I thought I’d do a little trial run. Those of you who know my blog know that I’m a huge fan of saving money, and I’m a bit of a cynic at heart. Just because someone says that they offer the lowest prices, I don’t believe them, and I work hard to find the best deals – especially on groceries and toiletries – and pay the least that I can in all circumstances. So when I read Aaron’s post about Walmart’s Savings Catcher, I was intrigued to say the least. Could it really save me money – someone who works fervently to find the best deals anyway? I decided to do a 30-day Walmart Savings Catcher trial, starting on April 14th, the day of Aaron’s post. This part was worrisome to me. I am NOT a techy person, as Aaron and Charlie will attest to. But when I went to register for the Savings Catcher, I found it so simple to sign up and use. What a relief for someone like me, who’s not big on the techy stuff. After registering, I simply sign in with my self-created username and password. In the upper left-hand corner, clear as a bell, it says “Enter Receipt”, where I simply put in the number located at the bottom of my receipt, along with the date of the purchase. 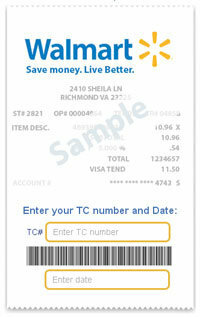 Walmart Savings Catcher verifies that they’ve received the correct information, and from there, I simply wait. We compared the items on your receipt to the items advertised by top stores in your area and didn’t find any of them advertised. Savings Catcher Credit $2.00 – We found some advertised deals that were lower than the price you paid at Walmart so we are giving you the difference. Enjoy! Walmart also lets you know if they’ve found that items you purchased from Walmart were already lower than the competitor’s prices with their Walmart Savings button. The money I’ve “earned” from the Savings Catcher then sits in my online account, until I’m ready to print out a gift certificate or use my Smartphone to redeem my dollars in e-card form on my next Walmart purchase. All said and done, in the 30 days I tracked my purchases, I spent a total of $642.44. My total Walmart Savings Catcher rebate? While this one-half of one percent may not seem like a lot of cash, I’m happy with it, knowing that I’m doing everything I can to save money, because all those dimes, nickels and dollars really do add up. If I spend this same amount of cash at Walmart each month for a year, I’ve earned savings equal to a good $36. Considering I’m already so prudent at finding the lowest prices, I think this is a pretty good deal, and I’m looking forward to using the Walmart Savings Catcher for all of our Walmart purchases going forward. I stop wasting my time with it The savings that I had in my walmart account just disappeared without been used it. i have an savings catcher with WalMart and somehow I lost the password so i cannot find the 9.00 i have in this account. Is there anyway someone can help with this problem. Savings Catcher may work for matching “competitors” ads — but oddly enough, the Walmart Savings Catcher program refuses to match Walmart’s own published prices. I just recently signed up for it . My first run I got almost $10.00 back. I am getting ready to put my second one in now. That’s great, Shannon! Glad you’ve found success here! I have to agree with Edward :/ I avoid Walmart at all costs. Some savings are not worthwhile. We all have causes that are near and dear to our hearts, and I’m a firm believer in standing up for what a person thinks in their heart is right and important. Good for you for doing so, Stefanie! Jody, SO sorry you have had such a horrible experience – how frustrating!! I’ve never had to report an error, so can’t counter or agree with your experience, but if it were me, I’d feel the same way you do. Bad customer service is simply unacceptable in this day and age, when there are so many stores to choose from. That’s a great deal that Walmart offered. Groceries are just one of the biggest cut of my income and I see to it that every time I need to go to the grocery I have my loyalty card with me, it’s either I can convert my point into cash or receive a grocery items. Those extra pennies and dollars really add up, don’t you agree, Marie? And you’re right about groceries: they’re a big cut of the budget. Hopefully, since we planted gardens this year, we’ll have some huge cost savings there. The cost of buying from Walmart can not be figured in dollars alone. The cost of paying for food stamps for their employees and the cost to the environment by Walmart must or should be included. If you add these cost I don’t think Walmart is a bargain. I did not included the of mom and pop stores they run out of business. Walmart cost are too high for me. Thanks for your comment, Edward. It’s important to hold true to the beliefs that we as individuals hold dear. Good for you for doing so. This is true. However, until we actually band together and stop shoppingat Walmart, individuals such as yourself are only hurting yourself. I agree with what you are saying but it requires more than an individual effort to make an impact. Until then, I will continue to shop there as the alternative is far more expensive individually than shopping at Walmart.